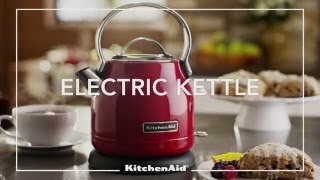 KEK1222 1.25L Electric Kettle Empire Red is rated 4.3 out of 5 by 23. Rated 5 out of 5 by RIPIN JIT SINGH RAHUL from Elegance At It's Best This is one piece of an equipment that makes your kitchen shine. A cut above the rest. I was very considerate about the price of the kettle as compared to other local or international brands. But being a chef myself and have being using KITCHENAID since a long now I opted for the brand. It sits in very well with my cream marble top and gives me a feeling of ultimate pleasure to use and look at it. Rated 1 out of 5 by DB82 from Surprisingly Ordinary Received this item as a gift at Christmas. Paint already chipping from the outer base, and upon closer inspection, mould starting to grow internally - after two weeks. I wouldn't expect this from a $15 kettle, let alone one ten times that price. To KitchenAid's credit, their customer service team have been great. Responding to emails within a day (rare these days) and they have organised to send me a new one, but, wondering whether the new one is going to be plagued with the same issues. I guess we shall see. Rated 1 out of 5 by Milo from Corroded within a year What a disappointment after loving our other kitchen aid products so much (mixer and toaster). The inside of the kettle was covered in rust within a year of purchase and Kitchenaid did not allow warranty claim saying they had no record of the online order placed directly with them less than a year earlier. Rated 5 out of 5 by Franki1 from simple old fashion design I originally bought another brand of kettle which leaked all over the kitchen benchtop within weeks of purchasing it. The leak was from the water guage and apparantly the glue was found to be faulty. After returning this on warranty I bought a Kitchen Aid kettle because of its 'old fashioned kettle' design and because it did not have a water guage. The simpler the better from now on. It has not leaked and looks great in my kitchen. Rated 5 out of 5 by BobH from Well desgined product We purchased this kettle to replace one of another well known brand as the plastic parts of the lid hinge broke. Thte KitchendAid product in contrast feels very well made, has a removable lid which we prefer and an internal water guage which makes it easier to judge how much water you have added when filling. The handle remains cool at all times and the kettle is reasoanbly quiet. The 1.25L capacity is perfect for just the two of us. Rated 5 out of 5 by Sammy from Wonderful styling excellent product Terrific product. Looks so stylish in my kitchen. Love the retro look accompanied with modern features. It is fast to boil, quiet and I like the fact that it doesn't beep at you when it has boiled. Absolutely love the colour, silver is so boring these days. Nice to see that colours in appliances have made a huge comeback. Highly recommend this product. Rated 5 out of 5 by Christine from Cutest kettle I absolutely love the kettle. It is sturdy basic and safe. I find it very comfortable in my small hand and there is no strain on my wrist while pouring at all. For us, in our later years, it is the perfect kettle. It looks beautiful and is very cute on display in the kitchen. Rated 5 out of 5 by JONJ from Cute jug This is a really cute design and it looks great on my bench. It boils quickly and pours well. The only downside is that with the fixed handle at the top it is a little fiddly to fill.